A monument commemorates the centenary of Ludwig Leichhardt's crossing of the Roper River on his exploration from Brisbane to Port Essington in October 1845. Friedrich Wilhelm Ludwig Leichhardt, a Prussian scientist, is remembered for his long journey in 1844-1845 from the Darling Downs to Port Essington, an early settlement in the far north of the Northern Territory. He proceeded up the Burdekin Valley, crossed the Dividing Range, and discovered the Lynd and Mitchell Rivers. After following the Mitchell, Leichhardt skirted the shores of the Gulf of Carpentaria. The exhausted party lost much valuable equipment at the Roper River and finally arrived at Port Essington, in December, 1845. He made the return journey by sea. 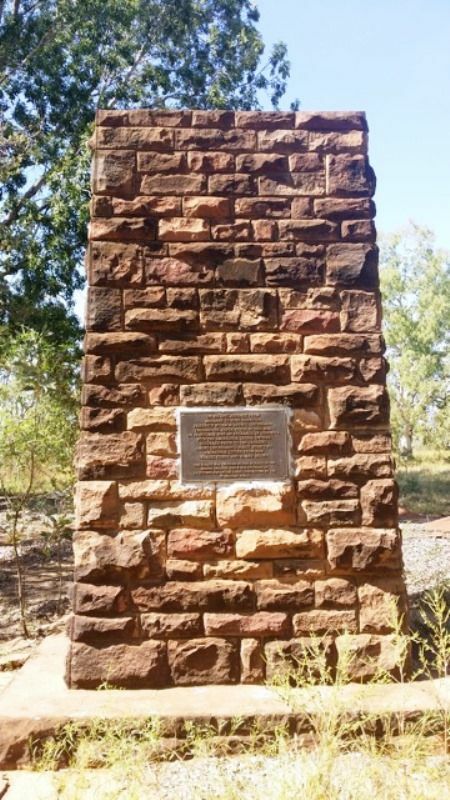 At the request of the Royal Geographical Society of Australasia the Northern Administration and military authorities erected a cairn of stone 12 ft high, 6 ft square at the base and 5 ft at the top to commemorate the centenary of Ludwig Leichhardt crossing the Roper River Northern Territory, at Leichhardt bar on October 24, 1845. The society will celebrate that event on October 24. Three thousand souvenir envelopes, will be issued at 4d. each, if addresses and postage are sent to the society in time, the hon. secretary in Queensland being Mr D. A. O'Brien, 217 North Quay, Brisbane. These envelopes will be dispatched to the Roper River, Northern Territory, Port Office and they will be posted there on October 24 at a function to be held at the unveiling. This will give them philatelic value. The cairn will be unveiled by the Administrator of the Northern Territory (Mr C. L. A. Abbott). The cairn is in the police station garden about 200 yards from the Leichhardt Bar crossing. The O/C, Constable J. J. Mannion, a member of the society, will represent the society at the unveiling, take photos and write an account for the society. Central Queensland Herald (Rockhampton, Qld), 6 September 1945. Occurred Prior To The Crossing. Charles Fisher And Harry Brown.